Quick overview Enables students to explore religious ideas and culture in terms of the players (key figures), the script (foundational texts) and performance (religious practices). This book includes the principle (God, Dharma, Dao), imaginal figures (angels, baals, bodhisattvas), exceptional persons (founders, prophets, gurus), and historical persons. 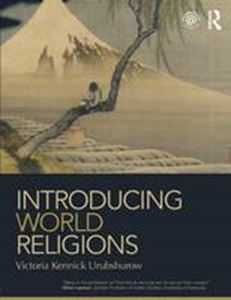 Introducing World Religions offers an exciting new approach to the study of the world's religions. Taking its inspiration from performance studies and using an innovative dramatic metaphor, it enables students to explore religious ideas and culture in terms of the players (key figures), the script (foundational texts) and performance (religious practices). The discussion of key players treats human and non-human figures on the world stage, including the principle (God, Dharma, Dao), imaginal figures (angels, baals, bodhisattvas), exceptional persons (founders, prophets, gurus), and historical persons (significant players in the drama of religions). The discussion of the foundational texts includes materials that balance or challenge mainstream texts with an alternative perspective. The section on performance explores non-verbal religious activities such as pilgrimage, icon painting, dance, divination, and meditation. Those concerned with introducing "post-colonial" discourse to students without losing the classic category of "the sacred" should find this textbook to be balanced and evocative. It presents workable concepts from the camps of both "religionists" and "reductionists" and students are challenged to move between "inside" and "outside" positions as they survey what have been called (controversially) "world religions". Specially designed to assist learning it includes: * chapter timelines showing key persons, events and dates * themed boxes to encourage methodological enquiry * key-point chapter summaries to support understanding and review * study questions to assist classroom discussion * maps, charts and photographs * glossary of key terms and concepts * key reading, a comprehensive bibliography and index. Ideal for one-semester or modular introductory survey courses on the world's religions, Introducing World Religions will be essential reading for any student of religions, worldwide. The accompanying website to this book can be found at http://www.routledge.com/textbooks/9780415772709.